Be the first to hear about their new releases and deals. Download the Booksprout app and search for Cordelia Castel today! 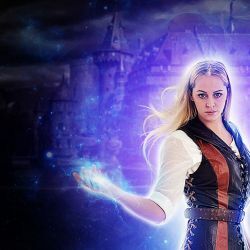 When Cordelia Castel isn’t trying on glass slippers, she’s writing fairytales about heroines who wield weapons, defeat the villain and save the prince all in time for the ball. Cordelia is the author of The Seven Kingdoms, an action-packed, Young Adult series featuring all the fairytale heroes and villains.